Hand Warmers Designed by Deborah Hedges. Hand Warmers fit most women. Scarf measures 6" wide x 65" long without fringe. MODA DEA™ "Ricochet". Art. R107 (1.76 ounce/76 yard ball). Hand Warmers: 1 Ball No. 2955 Jazz. Scarf: 3 Balls No. 2955 Jazz. Crochet Hooks: 6 mm [US J-10] for hand warmers; 6.5mm [US K-10.5] for scarf. Stitch marker; yarn needle. GAUGES: Hand Warmers: 11 sts = 4"; 14 rnds = 4" in sc rnds with smaller hook. Scarf: 12 sts = 4"; 13 rows = 4" in pat with larger hook. CHECK YOUR GAUGE. Use any size hooks to obtain the gauges. HAND WARMERS (Make 2): Ch 24. Rnd 1: Sc in 2nd ch from hook and in each ch across; join with a sl st to first sc taking care that work is not twisted - 23 sc. Mark first sc. Rnd 2: Sc in each sc around; do NOT join. Rep Rnd 2 until 4 ½" from beg. Divide for Thumb Opening: Sc in first 9 sc, ch 5, skip next 5 sc, sc in last 9 sc. Next Rnd: Sc in each sc and ch around - 23 sc. Work even in sc until 4" above thumb opening. Fasten off. Sew first and last sc of Rnd 1 together. Weave in ends. Row 1 (Right Side): Sc in 3rd ch from hook. * ch 1, skip next ch, sc in next ch; rep from * across; turn. Rep Row 2 for pat until approximately 65" from beg. Fasten off. Weave in ends. Fringe: Cut forty 12" strands. Knot 5 evenly-spaced groups of 4 strands to each end of scarf as follows: Fold each 4-strand group in half to form a lp, insert hook through fabric from wrong side and into loop, pull loop through fabric, draw ends through the loop, pull ends to tighten, trim ends. Hand Warmers fit most women. Scarf measures 7" wide x 48" long without fringe. MODA DEA™ "Ricochet". Art. R107 (1.76 ounce/76 yard ball). Hand Warmers: 1 Ball No. 2965 Swing. Scarf: 2 Balls No. 2965 Swing. Knitting Needles: 6 mm [US 10] for hand warmers; 8 mm [US 11] for scarf. Yarn needle; crochet hook for applying fringe. 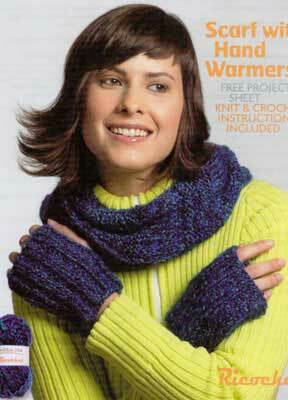 GAUGES: Hand Warmers: 18 sts = 4"; 27 rows = 4" in rib pat with smaller needles. Scarf: 12 sts = 4"; 20 rows = 4" in ridge pat with larger needles. CHECK YOUR GAUGE. Use any size needles to obtain the gauges. HAND WARMERS (Make 2): Cast on 38 sts. Row 1: P2. * K2. P2; rep from * across. Row 2: K2. * P2. K2; rep from * across. Rep Rows 1 and 2 for 3". Divide for Thumb Opening: Work in pat for 17 sts, bind off next 3 sts, work in pat to end. Next Row: Work in pat to bind-off, turn, cast on 3 sts, turn, work in pat to end - 38 sts. Work even in pat until piece measures 6" from beg. Bind off. Sew side seam. Weave in ends. Rows 1, 3, 5, 6, 8, and 10: Knit. Rows 2, 4, 7, and 9: Purl. Rep Rows 1-10 until 48" from beg, end pat Row 5 or 10. Bind off. Weave in ends. Fringe: Cut forty four 12" strands. Knot one strand in each st across each end of scarf following directions for crocheted scarf, using single strands instead of 4-strand groups. ABBREVIATIONS: beg = begin(ning); ch = chain; K = knit; mm = millimeters; P = purl; pat = pattern; rep = repeat; rnd = round; sc = single crochet; sl = slip; sp = space; st(s) = stitch(es); * = repeat whatever follows the * os indicated; [ ] = work directions in brackets the number of times specified.